Students acquire knowledge from various aspects – the curriculum, boarding disciplines and diversity. A rare opportunity for students to learn the International Baccalaureate curriculum from highly experienced academics. Our holistic approach helps bridge the gap between theoretical learning and practical application. School years are the most important time of a child's life. During this period everlasting friends are made, independence is groomed and self-awareness is developed. We benefit from talented day students, but our student body is dominated by boarding students, and this concentration creates a vibrant, lively, and close-knit community that fosters the development of every student. Our well stocked library consists over 9000 books, magazines, encyclopedias & journals on various genres such as academic, non fiction and fiction. 'The mission of PHIS is to challenge and enable students to reach their individual potential in mind, body and spirit while building responsible global citizens'. At Pledge Harbor we advocate the concept of ‘positive education’, which instills optimistic mindset among growing students. Students are schooled with exclusive proficiencies, to be cultivated into distinct individuals with leadership abilities. Your children are not just your heirs; they also inherit a nation poised to grow spectacularly. Hence, at PHIS, we work towards building relationships, steering positive sentiments and developing individual resilience. We believe that youthful minds are pliable and thus we put forth our paramount efforts into nurturing our students towards being confident analytical thinkers and dynamic leaders. 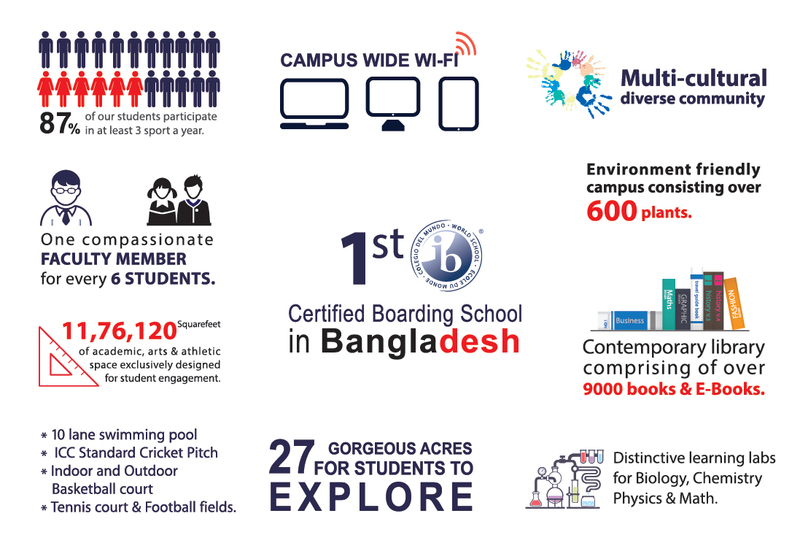 Student life at Pledge Harbor International School is a rich and vibrant experience. Striving to provide a well balanced spiritual, academic and social well-being, students are encouraged to both serve and participate in and beyond our community. With plenty of room for opportunity, students can engage in over ten sports, the arts, and equally a number of student driven clubs. One our exceptionally talented students - Nasif Rahman has been awarded by Cambridge International Examinations (CIE) at the Outstanding Cambridge Learner Awards. He has been awarded for being the "Country topper in Mathematics"! Pledgeharbor — is a private, coeducational, college preparatory day school.